Whether it's Annabelle or The Nun or The Crooked Man, they're scarily iconic in their own rights. Yet we, as the audience, can't deny these characters play with the classic horror element that gets us every time. The character of Annabelle is a doll, she has blonde double braids tied with red ribbons, a white tea party styled gown with a red belt at the mid waist, and a pair of white shoes. If you're ready to dress so spooky and ready to dig in, checkout our DIY tutorial and item down below on how to dress like Annabelle the Doll. 1 White Gown Get a plain white gown to wear. 2 Red Fabric Belt with Flower Wrap a red fabric belt around your mid waist. It would be accurate if you can find a belt with a big flower on it. 3 White Slippers Ghosts wears shoes too! Match up white slippers with your outfit. 4 Double Braided Brown Wig Get a wig to recreate Annabelle's iconic hairdo. 5 Red Ribbons Tie a bow on both ends of the braids. 6 Face Paint Get face/body paints in black white and red colors. Paint your revealed skin in white. Then follow the make up tutorial down below for the face. 7 Full Costume for Adults Don't have time? No worries! 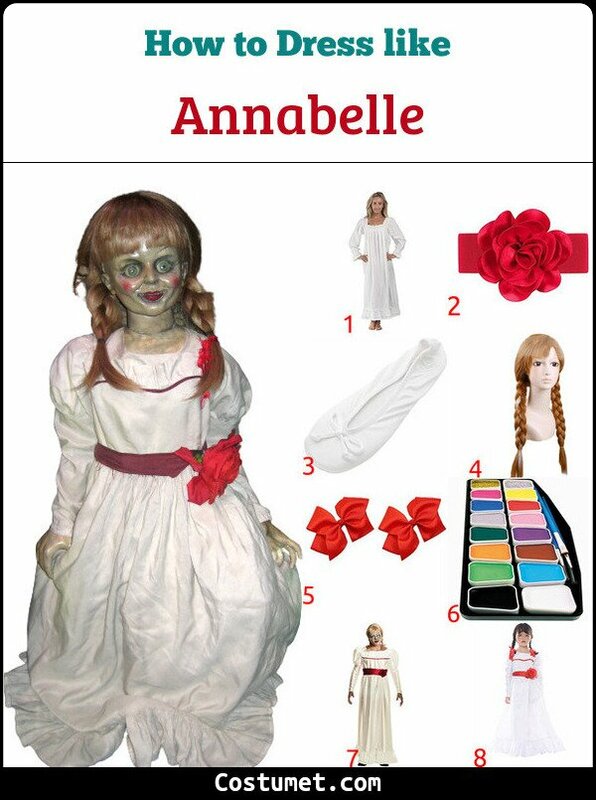 Grab this complete Annabelle costume. 8 Full Costume for Kids It's your kid's costume? No worries and grab this! Before both characters had their own spin offs in Annabelle and The Nun, they were firstly introduced to the horror-movie goers in The Conjuring franchise where Annabelle stole the spotlight in the first one while the Nun did the same in the sequel. As for these spin offs, Annabelle and The Nun play out as the origin story for both character before they came across Ed and Lorraine Warren (in the movie world). As revealed in the films, both Annabelle and the Nun aren't mere spirit or ghost. They, in fact, are vengeful demons that prey on human soul. While the Nun's real demon's name is revealed as Valak, the demon's name in Annabelle remains untold.